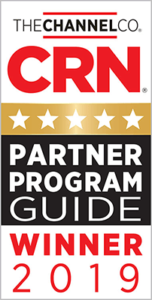 CRN®, a brand of The Channel Company, announced on April 1st that it has given DataCore Software a 5-Star rating in its 2019 Partner Program Guide, marking the ninth time the company has achieved this rating. The annual guide identifies the strongest and most successful partner programs in the channel today, offered by the top technology suppliers for IT products and services. The 5-Star rating recognizes an elite subset of companies that offer solution providers the best partnering elements in their channel programs. First, and foremost, DataCore is 100% channel-oriented. The company enables partners to leverage their consultancy, service and support capabilities, in order to improve their profitability. On top of that, marketing support is key to provide the necessary framework from which to start in order to properly position DataCore’s always innovative software-defined storage and hyperconverged solutions. Regarding the enablement and trainings provided, they allow partners to be continually updated on the latest needs, trends and features, so as to differentiate themselves from the competition. Finally, the incentive programs allow to the ability to increase even more the profitability of the business partnership between DataCore and the channel, to allow for further investments on internal development activities. Here at DataCore, we’re committed to providing our partners with the utmost opportunity to expand their businesses, which is why our partner program is designed to extend special privileges to sales and service organizations that demonstrate a commitment to solutions based on our software-defined storage and hyperconverged offerings. From our standpoint, great partners believe in being different – the ones that want to offer their customers something other than what the masses are providing today. A great partner believes that software-defined storage is the way forward, and knows that they can attain a much better and more flexible solution with our products, rather than a more traditional/standard offering. These are the type of organizations we strive to partner with moving forward. After the simple process of becoming a partner, the organization is authorized to procure our products/services from authorized distributors and resell to their own clients. We offer financial incentives for our partners, including discounts on software—and beyond that, a variety of training, both web-based and instructor-led, to ensure they are well-equipped and knowledgeable about the company’s software-only solutions. Another perk of being a partner is having free access to DataCore’s partner portal, which contains whitepapers, solution briefs, additional training, competitive tips, and technical documentation – valuable resources to help our partners get up and running to expand their offerings. Interested in becoming a partner? Click here for a partner application and begin the process of expanding your business and profiting by selling DataCore solutions.